Over the past year, SV@Home has been convening Housing Huddles to learn from a diverse group of community members how housing issues are impacting people from all walks of life across our County. We’ve had the privilege of meeting with teachers and members of faith communities, disability advocates and neighborhood leaders, seniors and service providers. You’ve shared your stories and helped brainstorm how we can bring more people into the conversation to support real solutions. Our housing huddles were designed to give people not often involved in housing discussions an opportunity to converse with their peers and surface shared challenges. 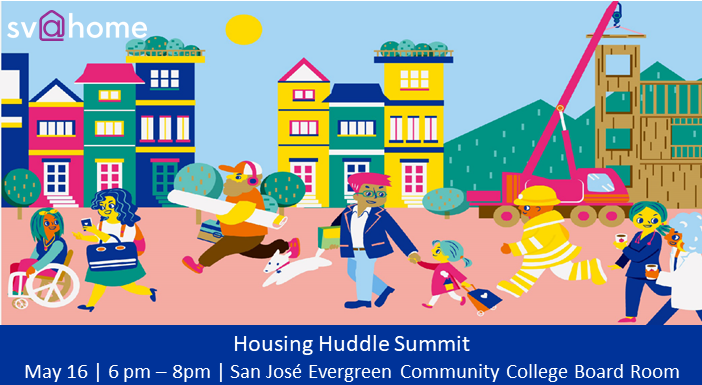 Now we are going to magnify these individual conversations and tie them together during Affordable Housing Week at our first Housing Huddle Summit! So join SV@Home, your peers, and representatives from different backgrounds and sectors to find the commonalities that link us while building the innovative partnerships we need to implement real solutions to our shared affordability crisis. Come prepared to share your own ideas and meet new partners. You –the community members– will help set the agenda and contribute to the discussions based on your own experiences. We can’t wait to see you all there for what promises to be a learning and growing opportunity for all of us. Special Guests To Be Announced! Driving the creation of affordable housing for a more vibrant and equitable Silicon Valley. Join us at Affordable Housing Week 2019! Stay up to date on this event and more by subscribing to our mailing list.